Boost commercial lighting design with the stylish 12" Warehouse Shade on a gently arching gooseneck arm. This outdoor-rated gooseneck light is made from commercial-grade aluminum with a rust resistant powder coated finish. Each fixtures comes with a choice of 25 finish options, 5 of them available at standard pricing. 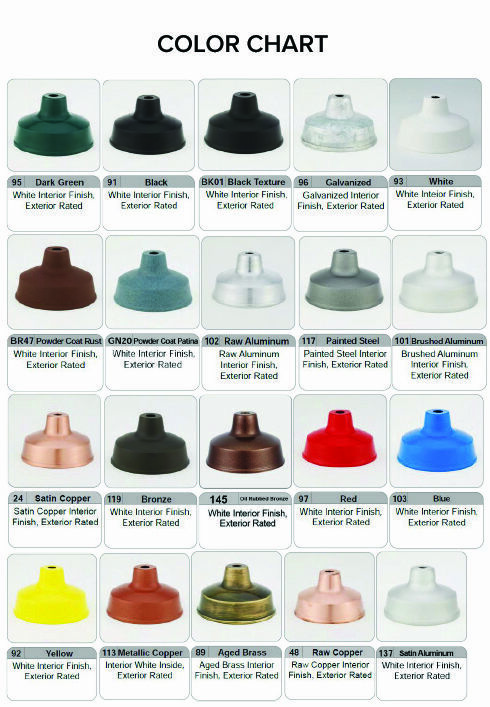 Order incandescent Warehouse Style Goosenecks online, or call toll free to upgrade lamping. Sign Bracket Store also offers two HID options, metal halide and high pressure sodium, in addition to energy efficient compact fluorescent and LED gooseneck lights. Price quotes are offered over the phone. Exterior gooseneck lights come with the Warehouse Shade, arm extension and a cast aluminum mounting plate. Back plates go over most standard 4"D j-boxes. All parts are powder coated to match, except the inside of the shade which is left white. UL Listed Warehouse Lights can also be ordered with accessories like cast guards; please call for details.